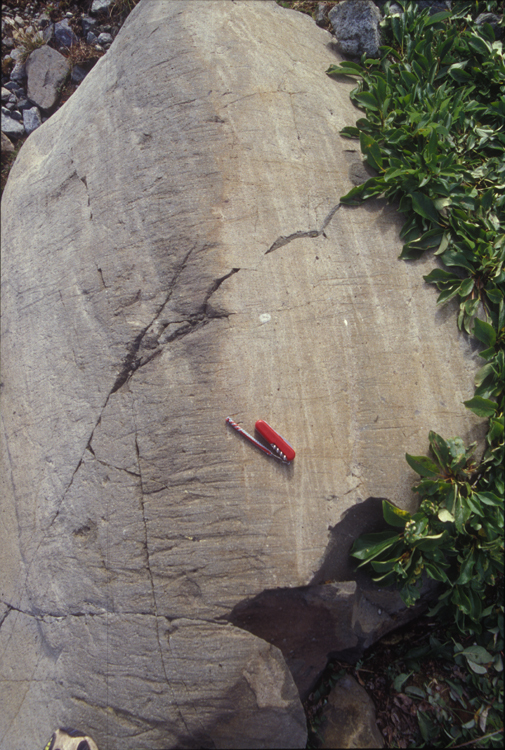 A rock near C26 shows two prominent striae directions. Striae are grooves left by rocks being dragged over other rocks at the base of a glacier. This rock appears to be bedrock and there are other examples in the area, so our interpretation of what happened was that the glacier flow direction switched at some point in the past. Probably during the Pleistocene when the glacier was much larger the flow direction here was vertical relative to the picture, and later during the Little Ice Age when there was a smaller advance of the glacier, the flow direction was horizontal relative to the picture.